Theft – On April 01, 2016 at 7:35am, Patrolman Dennis Allen responded to a residence on the 100 block of Windward Avenue for a theft report. Upon the officers arrival, the resident reported that cigarettes and $12.00 in cash were stolen from the residence by an acquaintance who was still on scene. Officers charged a 24 year old Toms River man with theft. Fire Call– On April 03, 2016 at 6:05am, officers responded to an address on the 100 block of Pacific Avenue for a fire alarm condition. Upon the officers arrival they learned that the alarm was the result of a carbon monoxide detector activation. The Beachwood Fire Company responded and determined the residence to be safe. Identity Theft – On April 05, 2016 at 8:54am, Patrolman Sean Langan took a report while at headquarters from a resident on the 100 block of Neptune Avenue. The victim reported that they noticed some fraudulent credit card charges that appeared to have been made online from an unknown location. Criminal Mischief – On April 05, 2016 at 2:31pm, Patrolman Phil Schena responded to Mayo Park and met with Public Works employees who were reporting that the outlet covers on the pavilion were damaged. The report indicated that it appeared someone kicked the outlets damaging them. Fire Call – On April 08, 2016 at 9:05pm, Patrolman Dave Bowden was dispatched to a residence on the 1400 block of Windward Ave for a smoke condition inside the residence. The Beachwood Fire Company responded and determined that there was no fire just a smoke condition resulting from something left in the stove. Theft – On April 12, 2016 at 12:14pm Patrolman Phil Schena was dispatch to headquarters to meet a resident reporting that their vehicle was entered and items taken from inside. The resident reported that their vehicle was left unlocked on the 1400 block of Pacific Ave and someone entered the vehicle overnight and stole a gold chain and prescription medication. Warrant Arrest – On April 13, 2016 at 10:29am, Sgt. 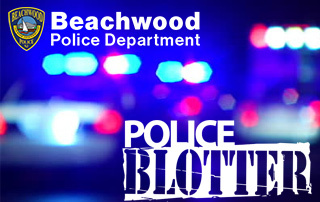 Frank Melillo conducted a motor vehicle stop on the 300 block of Beachwood Blvd. The officer learned that the driver had an outstanding warrant from Toms River and placed her under arrest. The 26 year old Barnegat female was processed at Beachwood Police Headquarters and turned over to Toms River Police. Begin receiving emergency notifications from our alerting partner CodeRed. Powered by Emergency Service Network Solutions.